When you are entrusted with the job of decorating a corporate indoor plantscape, you need to make sure it doesn’t just look great…but that it will last the distance. There are so many plants to choose from, but for those who want some bright colours in the mix…you might want to look at flowers. The first thing on your agenda would be the selection of species for this design. Many flowering plants will only last a week or two so how can you be sure your design will not fade away? There are a few things you will need to know before you get started. To add that ‘zing’ of life in a mundane ambience and keep it fresh, it’s low maintenance flowers you will want to install. We have something even more specific for you. 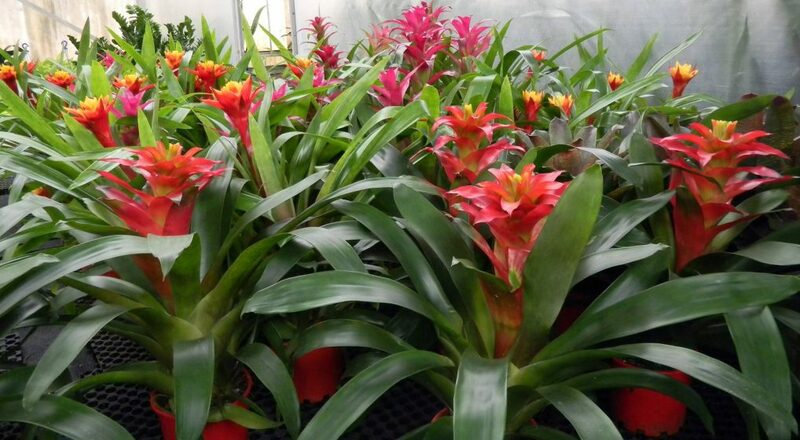 Bromeliads are excellent, ornamental flowering plants which can enliven any boring environment with their beautiful fleshy foliage and amazing variety of colours and shapes. These can be included in large floor planters or small desk plants and even grouped together to resemble a ‘garden’ in a bowl-shaped desk container. Their long-lasting burst of colours start from deep burgundies to light yellow, including orange, red and green flowers. 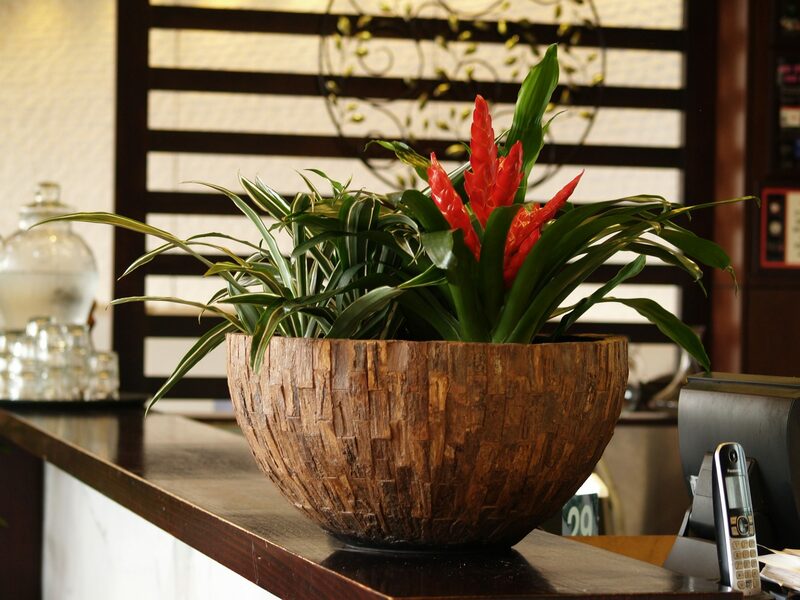 As a designer, you can embellish any indoor décor with the right choice of bromeliad. These can also add vibrancy to any existing dull arrangement of indoor plantings when the budget needs to be considered. American tropics being their native land, bromeliads receive their essential nutrients from rain and air. These plants are extremely adaptable to newer and unfavourable environments and many have been brought up in shade houses to ease them into the indoor office environment. 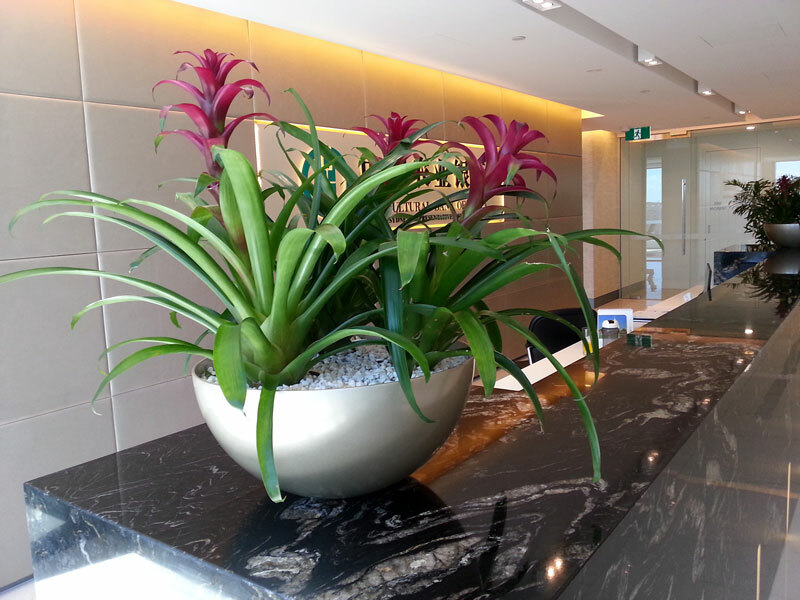 This is one of the major reasons why most designers choose bromeliads for office plants and gardens. These floral plants, being slow growers can thrive in medium to bright light. To flourish as an indoor office plant, 60% humidity and proper air circulation would be enough. However, make sure you don’t overwater them or expose them to direct sunlight for long hours. Watering should be from the top, pouring the water directly into the rosette centre, rather than into the soil and window sills should be avoided. Note: Bromeliads for indoors will have a dramatic blossom only once in their lifetime which will flower for up to 6 months. They will have ‘pups’ over time but this could mean no flowers for a duration. Consider an Indoor Plant Hire company who can replace your flowering bromeliads every 2 months to ensure you have flowers…all year round!